After last night's celebration I neither have the ambition nor the ability to put together coherent thoughts so my sentimonies will have to wait until tomorrow. 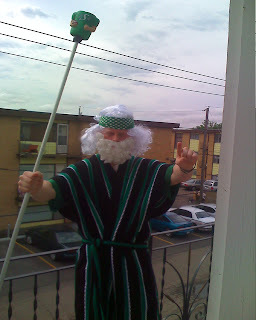 For now I will leave you with a picture of the new Rider Prophet robe I debuted yesterday at the game. Next time you see him - tell Willie Nelson to take off the bathrobe, put on some pants and stay off the damn balcony. hahaha... I'll be sure to pass along the message. Monday Morning Sentimonies: So Very Angry!